In this new mission you and your squad will need to securize a small town on a cloudy rainy afternoon. I will First complain about two minor glitches that really impact (sadly) the start of the game first, the loading screen is nearly unreadable and this is, I think, just due to some image convertion; second the mission start with an on screen message telling you it's 25 00 hours... those things should have been easily avoid by a correct beta-testing! So here we go in a well entering sequence of progression (planes) through a quite destroyed city leading to the main village. First of all, a brief mission will be tell by your officer using some custom voice acting that is sadly messed (but regarding to times I encounter this through maps and mods it seems not that evident to make something really audible or at least understandable). The environment is well put together with a really neat terrain creation and houses arround with the mess of destroyed things on the road. My attention was just catched by blue stagnent water close after the start that looked a little out of context (screenshot 1). Progression make you move fast without ambush to the objective update. Design continues to be brilliant and nearly perfect through you progression that is quite unlinear (different path leading you to the main street). The house you will need to visit though objectives are well put together and always provide variety in their architecture and construction (the church has perhaps a too modern touch?). 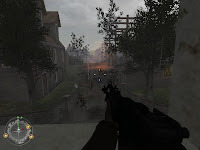 The fact that the location look quite dark didn't bother me cause it look logic for me that a house in a town during havy bombing on a dark cloudy afternoon looked this way. In the other hand it's quite unrealistic that bombs are only falling on you main travel path and not on surrounded houses (at least one or two should have been hit or destroyed). You will also encounter several 'colateral cutscenes' like the tank battle whish was interesting but didn't lead to a continuation (for example it would have look logic that you meet with the tank to continue the path and sudenly it would have been hit by a flak or something that would have been the next objective). 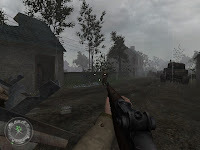 The gameplay is well crafted even if at first it seems to be a simple walk through the city, when you reach the first crossing with objective update the real action will start. Objective are well put together and well balance, the good enemies placement makes it difficult to take cover and really force you to rush into the battle. Afetr 'cleaning' the first area the objective that follow is to destroy the Flak (a little bit strange to walk arround at first without any objective on it and after finishing the mortars objective it become the new one..). Progression is well slow down by some german reinforcement in a real realistic way (not hords of them as they were falling form the sky) and will lead you to another part of the town where you will need to take back all house and also pick up some document the whole beeing accomplished when you need to meet with your officer and will see to rest of the batallion entering the town. There could also be a complain about save point integrated that make the gameplay tight in some spot this add certainly in play time but don't forget that when you are seriously hit it's time to take cover. In conclusion: There is no doubt that Ryan can handle the editor and that his experience from previous releases certainly help him making such a strong map. I really thing that in the future attention to what can be called negligable details (intro screen, voice acting,...) and perhaps to some more historical base experience with a good 'beta testing', could lead easily to some map comparable with IW map quality of original game. Defenetly another recommended release.